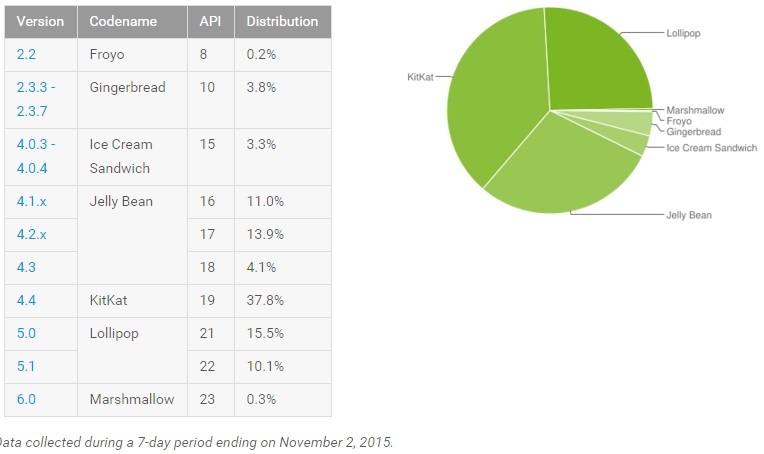 Android Distribution Stats for November 2015 is out now, Marshmallow debuts, Kitkat still popular. Google announced Marshmallow at Google I/O in June and unlike Apple, changes are not so quick when it comes to Android. It has been 2-3 months since Android 6.0 Marshmallow is around and we haven’t seen much devices running it. Marshmallow is a major Android version upgrade and its only now that we see it in Android version distribution statistics although with fairly 0.3 % of all Android devices adopting it.